Waterworks Lamson, a long-time producer of high quality fly fishing reels that we have loved season after season for decades, has hit the ground running in fly rod market with innovative designs that rethink the way rods and reels should work together. Lamson's reels are innovative, offer superior performance, and unmatched dependability. Saltwater or Fresh, Lamson Waterworks has been a company we have trusted for years. What about their fly rods? The simple answer is its the same story as their reels. Lamson fly rods are designed to flow--this comes down to physics, and Lamson has mastered the design of their rod and reel to give you a fluid and dynamic piece of equipment. The first thing you'll notice about Lamson's Center Axis Rod & Reel is that it looks differently than anything you've seen before. By closely aligning the mass of the Lamson Litespeed Reel with the mass of their new medium action fly rod, the two now operate on the same plane, as one unit as opposed to two parts working together. The result is a balanced and effective fishing tool like you've never felt before. This fly rod is truly the trout fisherman's dream, and we are very excited for whats to come in the future from Lamson Fly Rods. 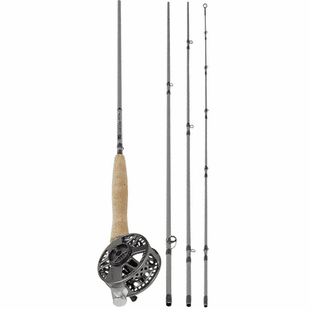 Center Axis Rod and Reel System: An artfully balanced rod and reel that work in close conjunction with one another to offer you the most balanced and effective trout fishing tool you've ever used. Truly a joy to fish with, check out more about it below!